We’d love your help. Let us know what’s wrong with this preview of Legend of The East Road by Hamilton Hill. The amazing adventures of three would-be adventurers and their quest to find a mysterious princess. When engineers start to build roads in Luhonono, strange things begin to happen. Ancient spirit legends start speaking to thirteen year old Magdalene sending her and her two companions, Peter and Gimbo on a mysterious mission. They soon discover that everything in Luhonono is not what it seems to be. The actions of an evil witchdoctor—‘Moja’ sets them on a course to find the Legend of the East Road. At the beginning of time, the ancient ancestors of Luhonono combined their souls to sprout a giant Baobab. Within its roots they placed a spirit mirror to separate the living from the dead. For centuries this power had been protected by M’tuna “The Gatekeeper” but now, the building of a new crossroad junction at the tree, causes upheaval and weakens M’tuna’s powers. Moja intends to take advantage, and turn the spirit mirror upside. His ritual will release an army of demons to help him take control and rule Luhonono. To ask other readers questions about Legend of The East Road, please sign up. My poem "The Ancients" was included in this book in spiritual exchange. The author went to print with his book and did not include my name nor any credit attached to my work, violating the sacred exchange and my copyright protection. I am disappointed in his behavior. Is this representative of how authors should support fellow authors? Guy Vestal - Counter Culture Critic I agree. Authors quibbling in public is very bad for critics. Readers may or may not care, but reviewers do. I was actually very excited about entering…moreI agree. Authors quibbling in public is very bad for critics. Readers may or may not care, but reviewers do. I was actually very excited about entering the giveaway, because this work is not your dime-a-dozen plot rework, but now I am a little uneasy. If I eneter the giveaway and win, it will take away a chance at winning something else I have not become weary over. It so saddens me to see peers incable of discussing their differences in private, as Mr Hill had asked about. I will put it on my to-read list, and hopefully it will make the cut in my monthly cleanings, but taking a risk on entering and winning isn't in the cards for me right now. One would hope that other authors that might stumble across this, heed the well known words of wisdom that Mr Hill has reminded us of, and keep discussion among peers, behind the scenes of the bookstore so to speak. I wish you luck Mr Hill, and if it comes back up as a giveaway, I will re-enter another time, at which time, I would be honored to read and review, and hopefully ask you for an interview as well. Although this book itself is classed as Middle grade fiction (8-12 year old) I have no shame in saying as an adult of thirty something I thoroughly enjoyed it. I really enjoyed this author's writing style, it is very Although this book itself is classed as Middle grade fiction (8-12 year old) I have no shame in saying as an adult of thirty something I thoroughly enjoyed it. I really enjoyed this author's writing style, it is very immersive and I was hooked from the first page. I enjoyed the interactions of the characters and the array of emotions they exhibit. I particularly liked how the author used traits associated with youth to drive the plot and further develop the characters. Disbelief becomes an open mind, friendly rivalry is a game of sport, and of course, there's the childlike belief of near invincibility as they push forwards and do what they must. There is also an injection of humour, as expected form the exchange between young teenagers, there were parts in this book when I actually laughed out loud, but I won't spoilt it by telling you why. On “The Roads of Luhonono: Legend of The East Road” by Hamilton Hill we are introduced to Magdalene, Peter and Gimbo, three tweens that go through many adventures together. While they try to prevent an evil witchdoctor from casting a malicious spell, they will have to face magic beings and wild animals on their attempt to travel across Africa to find the four spirit legends that could help them fight against Moja. This was a very entertaining story, full of surprises and with well developed, delig On “The Roads of Luhonono: Legend of The East Road” by Hamilton Hill we are introduced to Magdalene, Peter and Gimbo, three tweens that go through many adventures together. This was a very entertaining story, full of surprises and with well developed, delighting characters. Children of all ages will love to read it and parents will also enjoy the fantastic storytelling that this author is bringing to us. I can’t wait to read book 2 of this series! I’m sure the characters will go through many more adventures, and I wouldn’t like to miss the opportunity of being a part of the Luhonono’s journey. The Roads of Luhonono: Legend of The East Road by Hamilton Hill is a book aimed at middle graders. Legend of the East Road tells the story of three friends - Mags, Gimbo and Peter as they take their journey through Africa, while trying to save their village from a wicked witch doctor. The author combined facts with fiction and gives the book a realistic take. I’ve a read a few other books (general fiction) set in Africa, but ‘The East Road’, despite being a middle grade fiction scores better when The Roads of Luhonono: Legend of The East Road by Hamilton Hill is a book aimed at middle graders. Legend of the East Road tells the story of three friends - Mags, Gimbo and Peter as they take their journey through Africa, while trying to save their village from a wicked witch doctor. The author combined facts with fiction and gives the book a realistic take. I’ve a read a few other books (general fiction) set in Africa, but ‘The East Road’, despite being a middle grade fiction scores better when it comes to vivid description of the African Continent. The portrayl of traditional parts of Africa which are still untouched by modernisation of technology, where the ancient traditions and beliefs are still largely a part of people’s every day life, is simply intriguing. The author’s vivid details made me fall in love with the rich African landscape. Until now I’ve not thought much about Africa but now I want to visit the continent. The story is less of magic and more of adventure: there are real animals, the age-old African myths and adrenaline-packed quests of three pre-teens. The characterization is good. Right from the beginning, as a reader, you can connect with all the characters in the book. There are no awkward few pages of getting-to-know the people: they come and blend right in. The author has knack to breath life into his characters. There’s one thing I would like to mention. As the book is aimed at middle graders, its length and the vivid details can make children wary early in the story. I just wish Mags, Peter and Gimbo were older and not pre-teens, their adventures accordingly and the book was aimed at young adults. That way the vivid descriptions which are one of the strongest part of the book would, in no way, halt the pace of the story. When all is said and done, this book should be on shelves in all school libraries. It is educational, very informative and should be on to-read shelf of every child. This is a book I recommend to all parents: there couldn’t be a better way to teach children about Africa! The cover of this book captured my attention when I saw it on Twitter. I was also fascinated by the way the author was marketing it with a brilliant creation of appealing picture ads, so I decided to buy the paperback book—unusual for me because I usually only read on my Kindle. My intent was to read it and then give it to my 15 and 18-year-old grandchildren, who are avid readers. There were many things about this book that I enjoyed. First off, I loved that it was set in Africa-not modern Africa The cover of this book captured my attention when I saw it on Twitter. I was also fascinated by the way the author was marketing it with a brilliant creation of appealing picture ads, so I decided to buy the paperback book—unusual for me because I usually only read on my Kindle. My intent was to read it and then give it to my 15 and 18-year-old grandchildren, who are avid readers. There were many things about this book that I enjoyed. First off, I loved that it was set in Africa-not modern Africa that has been westernized, but in the outer areas when you could believe that ancient traditions and beliefs (witch doctors, etc) still are part of life. I loved the characters, who inspite of their varied backgrounds, became fast friends: Peter, who came from the outside world and had no idea about the customs and traditions of native Africa, Gimbo who is an African native and Magdalene who is a naturalized citizen. Hill skillfully created a story line that makes the reader aware of the very real physical aspects of the country and it’s wildlife, as well as the myths and ancient traditions of the natives. Gimbo and Megs have fun introducing Peter to Africa, but both Gimbo and Peter question Megs ability to connect with invisible spirits. Peter is determined to become as in-tune with this new world as his new friends. I had to chuckle when they were looking for “the princess.” Also, I was captivated when the spirit as led Megs to the poachers and gave her guidance to protect the three friends from the evil witch doctor. This was a “really cool” book from my point of view, and I am a senior. Unfortunately, my teenage grandchildren read more “popular” books—futuristic series with vampires and walkers – and they have not been drawn to read The Roads of Luhonono: Legend of The East Road. However, their mother, (my 52 yr old daughter), read it and thought it was very good. She believed that tweens would really enjoy it, as well as early teens who have not been introduced to more advanced reading from a young age. I highly recommend this book, and when school opens in September, I am going to donate my paperback copy to our local elementary school. I know the children will really enjoy it. 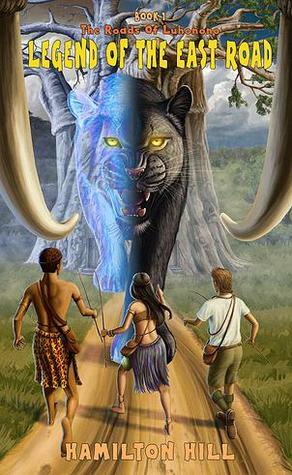 The Roads of Luhonono: Legend of The East Road by Hamilton Hill is a great book aimed at young adults. This book can resonate with anyone over the age of 9. The Roads of Luhonono Follows three friends,Gimbo, Mags, and Peter as they chronicle their journey through Africa,while trying to save their village from an evil witch doctor. Author Hamilton Hill, used fiction and non-fiction in his description of events, characters and locations giving this book a realistic take while breathing life into h The Roads of Luhonono: Legend of The East Road by Hamilton Hill is a great book aimed at young adults. This book can resonate with anyone over the age of 9. The Roads of Luhonono Follows three friends,Gimbo, Mags, and Peter as they chronicle their journey through Africa,while trying to save their village from an evil witch doctor. Author Hamilton Hill, used fiction and non-fiction in his description of events, characters and locations giving this book a realistic take while breathing life into his characters from start to finish. Gimbo's character is one to be admired while he has a strong belief of the many mystical tales and happening in his village he questions the many events that further enable him to understand his surroundings. Mags is more open minded and uses her mind to not only see what is visible to the open eyes, but what is also beyond that. Peter is the new friend in the group, his only brush with magic and the mystical journeys that lay ahead is from books he has read. However with the help of his new friends he is about to see things on a whole new level. I got this novel in giveaway and it took a lot for me and Author to let it reach to me safely. Though, This Book was really a good to read novel. I really enjoyed it. In starting it seems to me as the one which need more focus because of the Names and terms used in it, but with more and more pages that issue went away and I started feeling familiar with the story. Mr. Hill had done a good job for us to read and enjoy. The story is drafted so well and keeps the thrill and suspense for hat will happ I got this novel in giveaway and it took a lot for me and Author to let it reach to me safely. I really enjoyed it. In starting it seems to me as the one which need more focus because of the Names and terms used in it, but with more and more pages that issue went away and I started feeling familiar with the story. Mr. Hill had done a good job for us to read and enjoy. The story is drafted so well and keeps the thrill and suspense for hat will happen next. The life of African people is somewhere connected rightly. Their believes, culture, lifestyle; all are very well depicted in his work. Children must have enjoy this a lot. One should go for reading this novel at-least once. Friendship has been shown fondly. The trust in each other has been crafted with the flow of story very nicely. Africa seems really to be visited once in lifetime. This book was fantastic and I didn't even know it was graded for middle grade fiction until I started writing this review. Peter arrives in the village where Magdalene and Gimbo live and they immediately start adventuring together. They start out by spying on the princess, which is where the story takes its first twist. These three fast become best friends and its not long before Magdalene reveals her secrets to Peter who thinks she is a little loony. The story keeps a steady pace and introduces This book was fantastic and I didn't even know it was graded for middle grade fiction until I started writing this review. The story keeps a steady pace and introduces the reader to an interesting culture and customs. We follow these three friends are are able to see good character development and the rituals are detailed and quite creative. Hamilton Hill did a great job with this book. The book follows three friends (Magdalene, Gumbo, and Peter) on their adventures to save their village from the evil witchdoctor. Hill pulled me into the book from the very beginning with his descriptions and story line. In addition, his writing style made this book a real page turner. Time flew by while I was reading this and I finished the book within a couple of days. This book was a really good read. The characters are fascinating, and so are the myths and legends woven in to the story. The plot felt a bit slow at times, but the author's interesting writing style helped to make those slower moments easier to deal with. *NOTE: I was given a free copy of this book in exchange for an honest review. This has in no way influenced my opinion of the book, nor the contents of this review. My son loved it! Aimed at young adults it is set in a village in Africa full of spirits and a trio against the evil Witchdoctor! My son loves the unique setting and he's learned a few things as well. If your child likes the paranormal, fantasy adventure, then this is the book for you! A great bedtime read. When I first started this book, it grabbed me. I loved this story about three friends going on a magical journey. At times I wasn’t sure how things would play out because there were so many challenges facing Magdalene and her friends. I couldn't set it down until I finished! I may have to read it again...or a couple times. The Roads of Luhonono is a great and unique idea for a book. It has great writing and you won't want to put it down until you've reached the end. Telling the story of three friends going on a magical journey isn't anything new in literature, but Hill Hamilton tells the story so well that it seems like a completely new idea. Definitely worth a buy! The East Road” by Hamilton Hill is a story filled with mystery, magic, and spells. This story is about three adventurous tweens traveling the East Road in Africa on a hunt to find a princess filled with unknown consequences. I love Hamilton Hill’s style. He actually thought about the readers throughout this story. He actually introduces each character by giving background information about their beliefs, weaponry, tribe, traits and even nicknames. So when you read the story, it feels like you kno The East Road” by Hamilton Hill is a story filled with mystery, magic, and spells. This story is about three adventurous tweens traveling the East Road in Africa on a hunt to find a princess filled with unknown consequences. I love Hamilton Hill’s style. He actually thought about the readers throughout this story. He actually introduces each character by giving background information about their beliefs, weaponry, tribe, traits and even nicknames. So when you read the story, it feels like you know each individual personally and understands their purpose. The story takes place in Africa where three 13-year-old strangers met and became friends. These tweens, Gimbo, Magdalene and Peter are from different areas with different background and different beliefs but constant hanging out and enjoying each other’s company turn their acquaintanceship into a beautiful friendship. This friendship leads them on a journey or “spy mission” to find the princess. Strange things started happening along the way. Engineers started building roads and making changes to the land but the spirits were not pleased with the changes that were taking place. These changes created an imbalance between the dead and the living realm allowing evil to lurk around. What a perfect opportunity for the evil witch doctor, Moja, and his demons to take over Luhonono. Moja was known to play dirty after all he’s evil. The teens knew they could not win this battle on their own and needed help from a greater power against the spells. As the teens set out for their mission, they got focused and got stronger and some unrevealed powers like seeing the unseen in plain sight. There are many references to African traditions, rituals and their meaning like the Marula trees, mirror-gates, animal legends and spiritual recharging. The book cover grabs your attention but once you pick the book up and read the first page, you are hooked. Genius idea Mr. Hill, way to bait us in. If that wasn’t enough, for those of us that aren’t familiar with the African language, he put a words sound list at the end of the book to help is out with pronunciation. A fascinating African tale that will enchant readers young and old! I was immediately taken with the novel ‘The East Road’, as it was set in Southern Africa during the era when Zimbabwe was still called Rhodesia. Having lived in South Africa for 10 years, I relish the ‘feel’ of African-based novels. And, as a teacher, I instinctively seek out novels geared towards the young at heart. In brief, without giving too much away, the plot surrounds three friends on a quest: Peter, the newbie to Africa, A fascinating African tale that will enchant readers young and old! I was immediately taken with the novel ‘The East Road’, as it was set in Southern Africa during the era when Zimbabwe was still called Rhodesia. Having lived in South Africa for 10 years, I relish the ‘feel’ of African-based novels. And, as a teacher, I instinctively seek out novels geared towards the young at heart. In brief, without giving too much away, the plot surrounds three friends on a quest: Peter, the newbie to Africa, Mags, the dreamer, and Gimbo, the local boy with vast knowledge of his culture and continent. They join together to locate a ‘princess’ in a marvelous, hidden mirror world. The world-building is fantastic—I can envision the Baobab trees, hear the rush of the Zambezi and the snort of the hippo, and feel the tension build as the trio ventures near crocodile-infested waters and encounter a spitting cobra. The novel seamlessly blends historical Rhodesia with a surreal fantasy quest involving a ‘princess’, witch doctor, poachers, mind-dreaming, and countless dangers. Well-written, this captivating adventure, infused with the charm of old Africa, is a real page-turner. Highly recommended. I would like to thank Hamilton Hill for providing me a copy of this book! I found this book great for early readers! It was filled with action and drama that kept attentions and me me read on. It was filled with different cultures with a fun way of learning. This book was a quick read, as I read it in a couple of hours. I would recommend it to anyone 6+! This review was first published on Kurt's Frontier. When engineers begin to build roads in Luhonono in Africa, strange things are set in motion. Everything in Luhonono is not as it seems. The building of a crossroad at a junction at the ancient Baobab tree has caused and upheaval, weakening the barrier between the real world and the spirit world. The evil witchdoctor, Moja, intends to take advantage of the situation. By turning the spirit mirror upside down, Moja will release on an army This review was first published on Kurt's Frontier. When engineers begin to build roads in Luhonono in Africa, strange things are set in motion. Everything in Luhonono is not as it seems. The building of a crossroad at a junction at the ancient Baobab tree has caused and upheaval, weakening the barrier between the real world and the spirit world. The evil witchdoctor, Moja, intends to take advantage of the situation. By turning the spirit mirror upside down, Moja will release on an army of demons to help him rule Luhonono. Three youngsters, Magdalene, Peter, and Gimbo start off on a quest to find a princess and find a place of lurking evil. To save Luhonono, the trio must search for the animal legends that will help them stop Moja. Peter has just entered the world of Luhonono. Magdalene and Gimbo are waiting for him there, ready to start adventures in an unseen world. Setting out to find a princess and instead finding evil makes this novel roll forward. This novel was slow. Very, very slow. The first half of the novel happened, and nothing had happened. The princess they set This review has been crossposted from my blog at The Cosy Dragon . Please head there for more in-depth reviews by me, which appear on a timely schedule. This novel was slow. Very, very slow. The first half of the novel happened, and nothing had happened. The princess they set out to see isn’t all that exciting. I thought she might be in peril! And additionally, 2/3 explorers already knew who she was. I felt overwhelmed at all the detail, often I just wanted the story to happen more quickly! I couldn’t have cared less whether it was Peter or Gimbo who had the fastest eyes – their rivalry didn’t seem real. The relationships did develop, but it was in an awkward manner. This novel was written by someone who had a real love of African culture and traditions, but wasn’t able to merge it seamlessly into an exciting read. There was so much potential here, but it just didn’t make it in. Chopping out some more dialogue or trimming down the perspectives would make this novel stronger. For example, a simple discussion of a cubby house is stretched out over multiple pages to include a snake sighting (Chapter 6). I think a simple paragraph with the mysticism of the place would have done a far better job of setting the scene, and there was no need for all the internal dialogue by Mags. The ending was a disappointment. Just as the pace picked up and things became slightly more enthralling, very quickly they were over and the sorcerer was dealt with. I did finally feel vaguely like reading it at that point, so that meant I could give it 2 stars (I finished it after all). I’ve seen various things that have proclaimed this a ‘young adult novel’ or the back of the book which says it is ‘middle grade fiction’. Middle grade fiction is what this is. I’m not sure there were any deeper themes explored. However, I’m not sure if it common to middle grade fiction to start talking about the attraction that boys have for girls. Please correct me if I am incorrect – this isn’t usually my genre of choice. All I’ve seen elsewhere are overwhelmingly positive 5 star reviews, and it seems strange that I can only give this one 2 stars. It’s not the fault of the intended audience, I loved the Dragon of the Month Club. Did I somehow not read the same novel that they did? The Roads of Luhonono is a story that takes middle grade children out of their world and time into a culturally rich story set in Africa in the early part of the last century. The children in the story believe in magic and have a sense of wonder that is age appropriate and, more important, convincing to the reader. When the white tribe starts building roads, the villagers become concerned for their safety. Magdalene discovers that their concerns are legitimate when the ancient spirits speak to h The Roads of Luhonono is a story that takes middle grade children out of their world and time into a culturally rich story set in Africa in the early part of the last century. The children in the story believe in magic and have a sense of wonder that is age appropriate and, more important, convincing to the reader. When the white tribe starts building roads, the villagers become concerned for their safety. Magdalene discovers that their concerns are legitimate when the ancient spirits speak to her. The setting is one that the author paints with vivid strokes. Hill is a world traveler and that experience shows in a landscape that gives the impression of authenticity. The African landscape is vast and and pregnant with possibility. The introductions of infrastructure to the area call for overt descriptions are well edited and enhance the immersive experience. Esta historia sigue las aventuras de tres chicos, Peter, Magdalene y Gimbo. y lo que empieza como un viaje para espiar a una princesa acaba convirtiéndose en un misión para impedir que Moja use sus habilidades para convertir a los Unseen en su ejército personal de demonios. El problema de la novela es que es muy lenta, es más de la mitad del libro no pasa realmente mucho. Esto queda justificado en el hecho de que es el primer libro y está introduciendo al lector en un mundo nuevo con muchos términ Esta historia sigue las aventuras de tres chicos, Peter, Magdalene y Gimbo. y lo que empieza como un viaje para espiar a una princesa acaba convirtiéndose en un misión para impedir que Moja use sus habilidades para convertir a los Unseen en su ejército personal de demonios. Esto queda justificado en el hecho de que es el primer libro y está introduciendo al lector en un mundo nuevo con muchos términos y costumbres desconocidos. Aunque podían haberse resumido ciertas partes. ¿Qué decir del final? Me esperaba más, justo cuando todo empieza a ponerse emocionante, el asunto se resuelve en poco más de un capítulo. Así que en general es un buen libro, entretenido, al que le falta algo de ritmo y mayor desarrollo de las relaciones entre los personajes. I'm an independent West Australian writer, philanthropist and fundraiser for good causes. An ardent traveller I've visited over 453 cities in 51 countries and lived in 17 of those cities in 5 different countries. I specialise in writing novels set in the places that I've been and about the things that I've has seen. All of my writings, including The Roads Of Luhonono, are fiction based on fact.